As a human male who wasn't born until 1987, the year after James Cameron's seven-year-later sequel to Ridley Scott's 1979 masterpiece debuted, I was never overly inclined to invest much of my adolescence in Xenomophs or the lore of the talented Ms. Ripley. As someone who would unknowingly be lumped in with the millennial generation I didn't grow up with a fondness for those original films and thus they never became a critical part of the cultural landscape for me until much later in life. 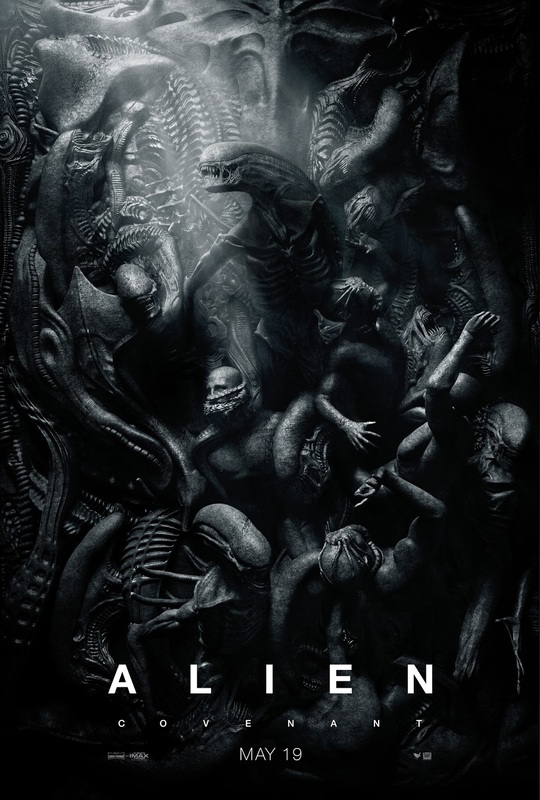 It might even be difficult for viewers with older tastes and dated perspectives to understand how such a film as restrained and measured as Alien might play for today's ADD audiences, but despite the fact I didn't end up seeing Scott's original film until a college scriptwriting class doesn't mean I didn't understand the how and why of its effectiveness. Still, because of the life experiences that shaped who I was up until the point when I saw Prometheus in the summer of 2012 I didn't mind that it felt completely different from what Scott had established as his Alien universe in the past. Like with music and most things in life if something works and people crave more of it the artist must find a way to strike a balance between what has come before while also reinventing themselves so as not to repeat the same old shtick over and over again. While many complained about Prometheus for being too heady and not so reliant on thrills or action Scott, along with screenwriters John Logan and Dante Harper, have seemingly course corrected for the sake of the fans with Alien: Covenant as the film more or less meshes what Prometheus started and what fans seemingly wanted in a new Alien movie. That isn't to say it all melds seamlessly or that Covenant is all the better for attempting to strike such a balance, but rather that it wants to have its cake and eat it too. As an individual who has no vested interest in continuing the Alien franchise as it once was, but who dug the hell out of Prometheus, I was slightly disappointed the more philosophical aspects of the film were traded in for more formulaic action beats and scares, but while Covenant may be a safer movie than Prometheus as well as a less effective film than Alien it is still very much an entertaining one that does enough good to earn its place among the ranks of a series that seems to be more well regarded out of nostalgia and a couple strong entries than a consistent quality in the films overall. 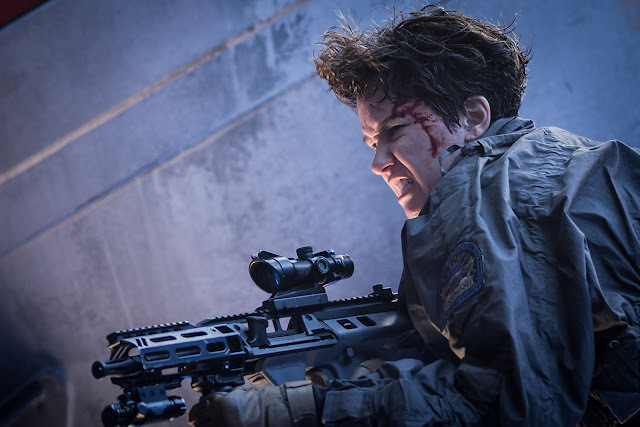 Rip-I mean Daniels (Katherine Waterston) fights back with firepower in Alien: Covenant. Covenant begins by taking us back to before the events of Prometheus as Peter Weyland (Guy Pearce) introduces himself, for the first time, to his own creation. We are of course talking about Michael Fassbender's humanoid robot, David. In Prometheus David accompanied Weyland on the mission headed by Doctors Elizabeth Shaw (Noomi Rapace) and Charlie Holloway (Logan Marshall-Green) in order to find out the secret of mankind's creation in hopes of prolonging Mr. Weyland's life for as long as possible. Still, it seems that all the while Weyland spent looking for his creator David was rather disappointed in his. David, the robot, yearns for his own meaning in life and through the events of Prometheus and now Covenant we come to find out that he's more or less decided what his rightful place in the cosmos is and, well, it's a tad egotistical if we're being honest. But how do we come to meet David once again if the last we saw of him and Dr. Shaw in Prometheus was the two of them leaving the moon LV-223 in search of the engineer's home planet? That is where the Covenant vessel and its crew come into play. It is approximately 2104, a decade after the events of Prometheus and eighteen years prior to the events of Alien, and the Covenant ship carries over two thousand life forms and frozen embryos who hope to establish a new colony on a distant planet-they're truly pioneers. Among the ship's crew is the more recent and robot-like version of David known as Walter (also Fassbender) as well as Oram (Billy Crudup) a man of faith who must assume the mantle of captain after the catastrophic events that open the film start the ball rolling on detouring the Covenant. Biologist and Oram's wife Karine (Carmen Ejogo) is also among the crew. Second in command is Daniels (Katherine Waterston), then we have pilots Tennessee (an inspired Danny McBride) and his wife Faris (Amy Seimetz) as well as fellow pilots and lovers Upworth (Callie Hernandez) and Ricks (Jussie Smollett). Lope (Demian Bichir) and a handful of other individuals bring up the rear as the muscle, explorers, and fellow scientists, but they essentially exist to be picked off one by one in no certain order. It is after the Covenant is hit by a power surge of some sort and the crew are forced to be woken up in the midst of their journey (which still has seven years to go until they reach their destination) that they receive a transmission causing them to divert to a planet they previously had no knowledge of which, obviously, nothing good can come from. One of the many reasons I'm a fan of the Fast & Furious franchise is the fact they are so committed to their timeline and their continuity while building onto the mythology of the franchise with each new installment and with Prometheus and now Covenant the Alien franchise is very much doing the same. On top of this, I'm generally a fan/fascinated by good science fiction, world-building, and interpretations/debates concerning where we came from and/or what our existence really means. In short, I'm a sucker for everything Scott and his screenwriters are putting together with this prequel trilogy. Some, and I'm going to go ahead and assume that most of the people that feel this way were born in the late sixties/early seventies, might see Alien and it's sequels as nothing more than contained stories with a badass protagonist that view the Xenomorphs as nothing more than an alien life form who come from the depths of space and if you want/need to know nothing more than that-fine, don't watch these new movies, but for those who find such ponderings and big ideas fascinating enough to unpack-let us have this. Let Ridley Scott have it. He could very well be making Alien and Aliens knock-offs with replica Ripley's (which is kind of what the last act of Covenant turns in to) all over the place that do nothing to push the story further or to more interesting places, with nothing to enhance the mythology of what we witnessed in Scott's first Alien film, but instead Prometheus and the majority of Covenant do just this. If Covenant manages to have one thing over its predecessor it is that it handles the balance of such large ideas and entertainment value more efficiently while still failing to garner audience interest in many of the human characters sans the android as Fassbender's dual performance as both Walter and David is the heart of the film. Ironic, considering neither of them actually have a heart of their own. Ledward (Benjamin Rigby) suffers some complications as Karine (Carmen Ejogo) and Faris (Amy Seimetz) look on in horror. Much like its predecessor though, Alien: Covenant is visually stunning as our troupe of scientists and colonists explore a new planet, a garden of Eden of sorts, that is at once breathtaking for its natural elements and lush greens while also revealing itself to be the home of what looks to have been (slight spoilers) an ancient civilization. This reveal is appropriately shocking as it adds a whole other layer to the mystery of what the crew of the Covenant have actually stumbled upon, while affirming for fans of Prometheus that this film has in fact taken into consideration many of the questions that film left unanswered. This aspect is also only revealed due to the intelligent inclusion of David who now serves as the most devious and horrific part of the Alien franchise. Logan and Harper's screenplay serves as something of a bridge between the conversation around Darwinism versus Creationism and more how the two might be able to coexist that Prometheus began and the event of Scott's 1979 film. Yes, the Xenomorphs make their first full on appearance in some time, but Covenant is hardly about the face huggers and chest exploders, but rather how their existence is a byproduct of the need for power; a need that has come about out of disappointment in one's own creators. David must reign over something himself, something better than even he is and much more advanced than the humans who created him. Alien: Covenant outlines the consequences of such curiosity and inevitable disappointment. It's a smart film that fulfills Scott's craving to take on more weighty material while at the same time operating within the universe that allows him to make such big budget sci-if horror films in this day and age. Covenant may not be as much my cup of tea as Prometheus was, but with the events that unfold here and the direction the next prequel is seemingly set to take-I'm excited to see where we go next.